Done right, planting a bed of asparagus is a once-in-a-generation affair. Other than artichokes, capers and rhubarb, asparagus is the only perennial vegetable regularly featured in North American cuisine - it will send up those slender, succulent stalks each spring for decades if it is given a happy home. But be prepared, this is no ordinary vegetable crop. Asparagus has a colorful history and seductive personality. And it is probably the most demanding vegetable there is to get started. It’s possible to grow asparagus by seed, but most farmers and gardeners leave this part to a professional nursery because the seed is so finicky to germinate. Instead, buying asparagus ‘crowns’ – a technical term for the dormant roots – is recommended. They look like a strange sea creature with roots for tentacles and a head in the middle where the spears sprout. The dormant crowns are available at local garden centers for a brief window in early spring, after the ground thaws, but before the crowns start sprouting. If you miss that window, it’s still possible to order them online from nurseries farther north. Some growers keep asparagus crowns in their walk-in cooler to prolong dormancy so southern gardeners running late on the garden season have something to plant. Heirloom varieties like ‘Martha Washington’ are still quite popular, though they produce male and female plants. Female asparagus plants produce pretty red berries in fall, but they make far fewer spears. To get a larger harvest, many growers opt for all-male hybrid varieties like ‘Jersey Giant’ or ‘UC 157’, which are highly productive and usually more disease-resistant than the heirloom types. ‘Purple Passion’ is one of the many varieties that produce purple spears. Growing white asparagus is a matter of layering soil over the spears so they don’t produce chlorophyll; you can do this with any variety. Ten crowns will fit in a 4-by-8-foot bed and are generally enough to supply a family of four. Try to time your purchase so the asparagus crowns can go in the ground without delay. If you have to store the crowns for more than a day or two, place them in a bucket of moist sand in a basement or other cool environment until you are ready to plant. Asparagus likes rich, well-drained, non-acidic soil. For best results, copious quantities of soil amendments should be incorporated into the planting bed to provide long-term fertility. *Your local cooperative extension service office can test your soil pH and tell you exactly how much lime to add to bring it up to 7. 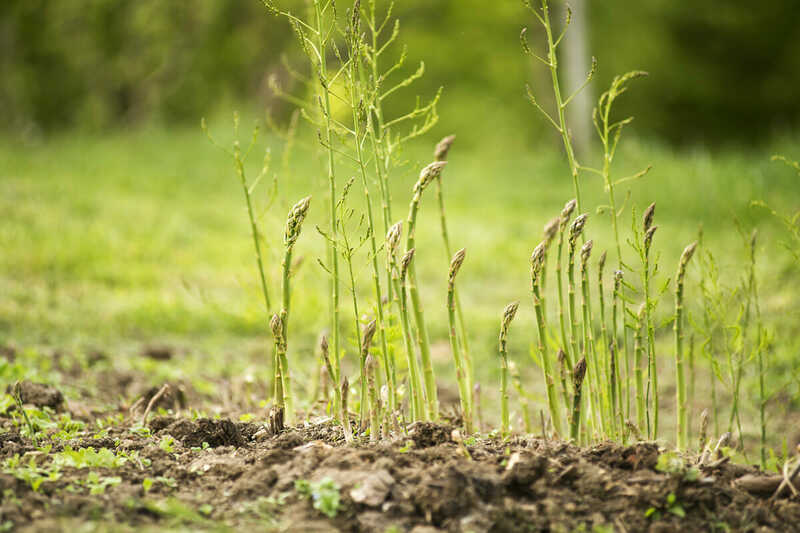 It’s important to wait at least one year after planting asparagus before making the first harvest so the plants can put as much energy as possible into developing a root system. In the second year, it’s OK to harvest any spears larger than a pencil for a week or so. In the third year, increase the harvest period to two weeks and in the fourth and subsequent years you can harvest all the spears that emerge over a six-week period. Unharvested spears will unfurl into a lacy canopy of foliage about 3 or 4 feet tall by early summer. Allowing the stalks to grow each year is necessary for maintaining a strong root system – making it possible for the asparagus to come back year after year with bigger and bigger spears. I am looking at purchasing 3 yr old male crowns. Can they be harvested in the first season?